Are We There Yet?? : Yes, Cyndi. There Really Are Bloggers! 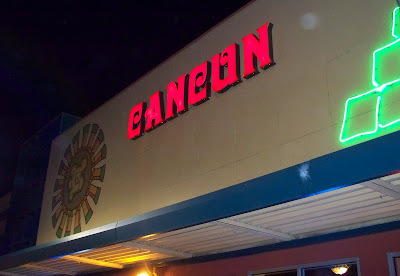 I doubt the Cancun Restaurant in downtown Stockton will ever be the same after last night when myself, Sandee, and Katherine descended upon the establishment to finally meet after having known each other virtually for quite some time now. Rumor has it that they've posted a sign on the front door stating that they reserve the right to refuse service to bloggers or people with cameras but I haven't been able to verify that yet! Sandee brought along her handsome husband Zane who took pictures and videos all night long in order to document our historic meeting, Katherine arrived on the back of a beautiful black Harley Davidson with her hunky Teamster, and I brought along my bestest friend Cyndi who, like Virginia with her Santa Claus, was skeptical that bloggers really existed. 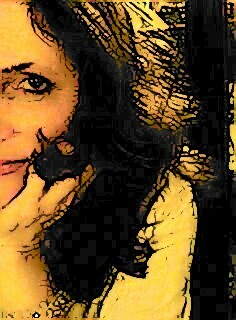 Ah but yes Cyndi, they really do exist and they are even more wonderful in real life than they are on the web page! Big hugs were exchanged all the way around in the foyer of the restaurant (and it didn't even occur to me that I'm not necessarily the hugging type) before we took over a table smack in the middle of the restaurant and ordered drinks and dinner. 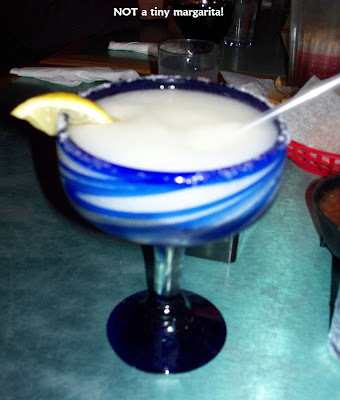 When my margarita arrived I immediately thought of Mags and our first meeting when the margaritas we ordered turned out to be tiny little things hardly worthy of the name! Much to Cyndi's bemusement I immediately whipped out my camera to photograph my drink but I think she was finally getting somewhat used to the idea that bloggers take pictures of absolutely everything and anything! Naturally I had to take a picture of my dinner when it arrived, too as I had been talking up the great Mexican food at Cancun for way too long NOT to post a picture of it so that people could see what I was talking about. Cyndi again shook her head thinking I had totally lost it while Katherine and Sandee knew exactly what I was doing and why! Sometimes I think being a blogger is somewhat similar to being a member of a society or group as there seems to be some sort of unwritten Blogger Code starting with "Thou shalt have thy digital camera with thee at all times and photograph non-stop"! 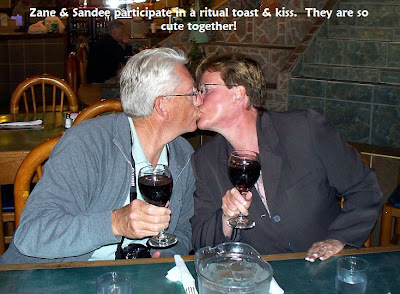 Sometimes we even make people repeat things as I did when Sandee and Zane toasted each other and then kissed when their glasses of wine arrived. Apparently it's a tradition for them and, being the overly romantic type that I am, I thought it was just the sweetest thing ever and I definitely needed a picture! They were more than happy to oblige and do a repeat for a photo op and I got the distinct feeling that it was a ritual that they participate in quite frequently - and I don't blame them in the least! Ah, love! It's funny how when you meet a blogger in person, you don't feel like you're meeting someone for the first time as you know so much about them and their lives beforehand. I felt like I was spending an evening with old friends as we laughed and joked and shared stories and I think that Cyndi felt just as comfortable as she added her own brand of "snarkasm" to the conversations. 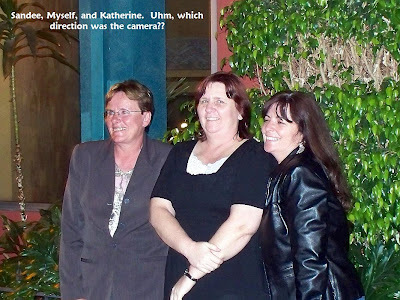 I'm sure it was easy for Sandee and Katherine to see why I would break my oath of "I'll never go to California" again to visit the friend who knows me better than I know myself. The time just flew by and before we knew it it was 10:00 and, with The Teamster having to get up at 4:30 to go to work, it was time to go. 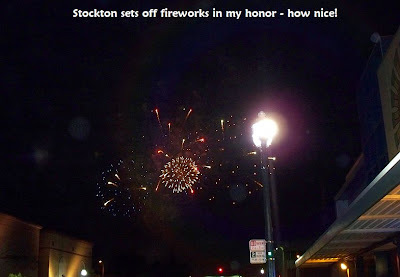 As we walked outside, the sky over Stockton lit up with fireworks - just for me! Well ... okay ... maybe not just for me but for The Ports, Stockton's minor league baseball team who had apparently just wrapped up their game but the timing couldn't have been better. I think that fireworks should be set off whenever blogging friends are able to get together and meet! We posed for a few more pictures and then exchanged hugs again before Katherine and her beau saddled up and got ready to make the trek south. As Sandee and Zane and Cyndi and I walked to the parking lot we talked about how wonderful it was to have finally met and how much fun it would be to someday have a Blogger's Convention where we would have the chance to meet so many more of the dear friends that we've made through this pastime of ours. It really is so special when you finally get to meet people that you have come to think of as friends and I was so happy to have met two of those very special people last night at one of my favorite restaurants with my favorite friend along for the journey. This trip has really been wonderful so far and I'm so glad that I overcame my hesitations at coming West as meeting Sandee and Katherine along with Zane and The Teamster was truly an honor and one of the highlights of my life. It appears that I've got two very good reasons to come out to California again! And finally, a picture of the food. I remember how we snapped photos of dinner in Connecticut last month. People DID think we were insane. 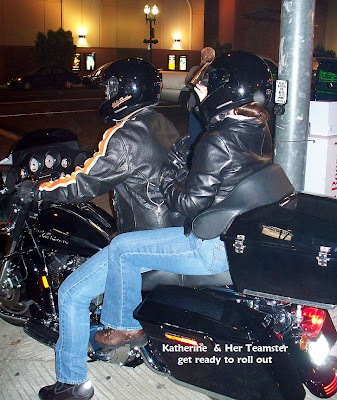 But what fun it was and this night seemed almost perfect.Mexican, Sandee/Zane are so adorable....Kat on a motorcycle with Teamster....Ah, love. GREAT photos. What a way to start your vacation. Glad you're having such a good time. P.S. The Queen ordered the fireworks just for you. I told them the "Duchess of Norwich Upon the Thames" would be in town shortly. Glad you liked them. I knew it was Mimi that ordered the fireworks. It was a great time Linda. I wouldn't have missed it for anything. way way cool, now I want mexican food, that looks so good. Meeting other bloggers has always been a happy time for us. Food and friends! What a wonderful combination! Sounds like you had a terrific time. I'm happy for you! 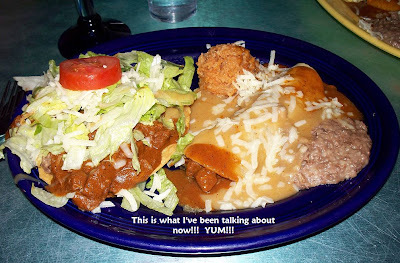 Now that dinner is just what I remember about Mexican food in California! Although, we have some mighty find spots up here for authentic food too. The photos look great, and it sounds like y'all had an awesome time. Just dropped by from Sandee's.....I think it's great meeting blog buddies....I've met five already myself....I'm glad you had a good time...those two are great people!!! Linda, your excitement just jumps off the screen at me. Happy for you, meeting more bloggers. I'll always cherish our meeting with the Queen. And you're right about feeling like you know a blogger when you meet them.